While the cases of forest fires have been increasing all over the world, most of them have been due to human activities and carelessness. As I’ve mentioned in my previous post, Forest Survey of India believes that 95% of the fires caused are due to human negligence. In this post, I’m going to be looking at whether climate change is having an effect on the intensity and frequency of the caused forest fires. (1) What kind of effects does climate change bring with it? (2) Do these effects supplement causes of fires? (3) What has been the trend in the last 10 years? Climate change in a global scale does not necessarily mean that the world will get hot everywhere. Climate change is different from global warming. There are places that have been getting hotter, like the Arctics. But there are other places on Earth that have been facing different responses to climate change. For example, the British Isles have been facing much wetter summers than have been seen before. India has seen dryer monsoons in the last 5 years than before. Likewise, Canada has been experiencing drier winters than previously experienced. USA experienced an unusually frigid winter last year. The gist is this: due to climate change, the climate around the world are becoming more extreme. How does this relate to forest fires? This situation is particularly bad with respect to forest fires. The drier and hotter conditions than usual are of special interest when it comes to studying forest fires. That is is because these conditions are conducive to start and propagation of forest fires (read Forest Fires: A burning issue). Wherever forest fires have been traditionally observed, we see that these places have become drier and warmer than they generally have been. The northwestern Himalayas this year saw much less rainfall than before during the months of February and March. North India has been facing warmer winters over the last 3 years as well (winter truly struck New Delhi only in the 2nd week of January this year). Consequently, the first case of fire reported from this region was Feb 2, compared to late Feb in the last 3 years. The spread of chir pine forests in these regions, as a consequence of changing ecosystem dynamics (and human intervention in some cases) has also been a factor in these forest fires. The fire at Fort McMurray. The greatest danger lies in the notorious boreal forests of North America. High latitudes of North America have been warming over the last few years. Warm and dry conditions have been the reason for the drastic increase in the number of forest fires. The 2015 assessment in Canada found that a total of 7,068 forest fires burned about 3.9 million hectares. The number of fires was slightly above the 10-year average, but the area burned was 50 per cent higher. 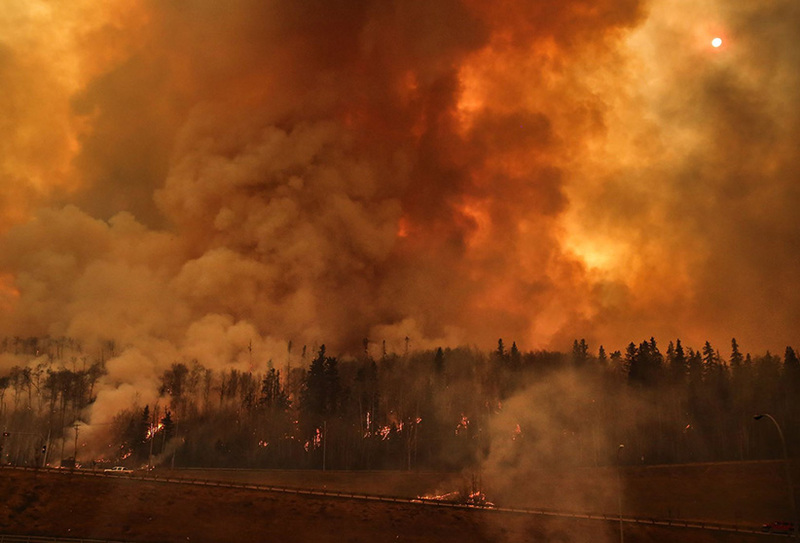 Studies have shown that the risk of forest fires will increase up to 4 times as compared to the last few decades, and by the end of the century, forest fires are expected to burn double the area it currently burns in Canada. While the data for India is insufficient, we would be foolish to expect anything different. warm, dry conditions —> more forest fires —> more carbon released into the atmosphere —> warmer, drier conditions. Forests, especially the northern boreal forests are massive carbon sinks, storing up to 50% of the world’s soil carbon content. The trees themselves store massive amounts of carbon within them, all of which will be released into the atmosphere in case of a fire. While the man-made forest fires can be massively minimized by simply being careful, naturally caused fires are likely to cause huge damages in the future. It is extremely important that we update our management techniques and work even harder in curbing the rate of climate change. An Introduction to Trends in Extreme Weather and Climate Events: Observations, Socioeconomic Impacts, Terrestrial Ecological Impacts, and Model Projections; Gerald A. Meehl,a Thomas Karl,b David R. Easterling,b Stanley Changnon,c Roger Pielke Jr.,a David Changnon,d Jenni Evans,e Pavel Ya. Groisman,b Thomas R. Knutson,f Kenneth E. Kunkel,c Linda O. Mearns,a Camille Parmesan,g Roger Pulwarty,h Terry Root,i Richard T. Sylves,j Peter Whetton,k and Francis Zwiers, 2000.